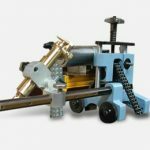 The portable flame pipe cutting & bevelling machine GB CUT F1 can perform cut & bevel of pipes range from 4” to 80” diameter. The cutting and/or bevelling is carried out by a cutting torch (acetylene/propane torch upon request) mounted on its specific torch holder. The holder is equipped with scaled junction in order to allow a perfect positioning of the torch on the cutting start point. 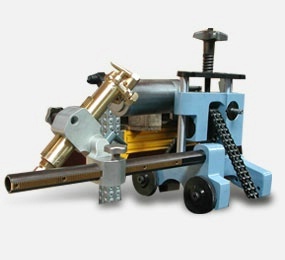 The resulting cut and bevel are therefore straight and precise all around the pipe thanks to a locking system composed of a double link chain and four adjustable wheels with different setting according to the pipe diameter to be machined. 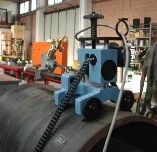 The chain is also used to feed the GB CUT rotation around the pipe. GB CUT is available in two versions, manual rotation by hand crank or – alternatively – low tension electric motorized rotation with remote control (the motorization kit can be supplied and mounted on the machine even later on as an optional). ROTATION – Manual or low tension Motorized kit with remote Control.